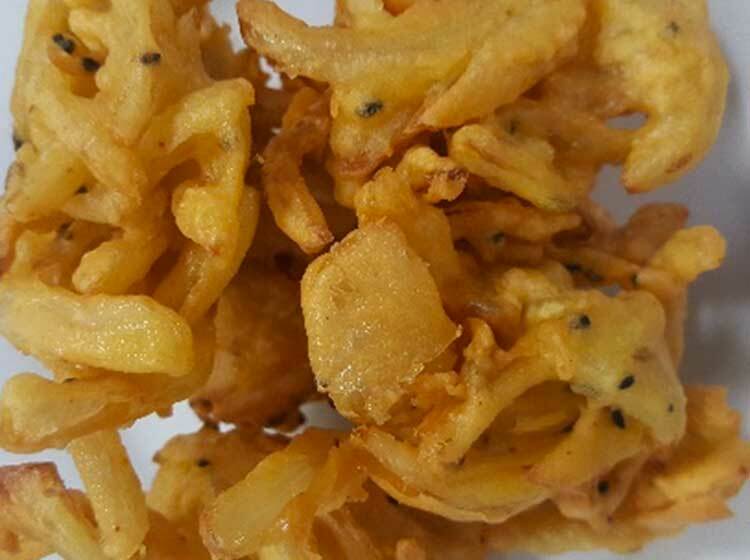 These onion bhajiyas are quick and easy to make. They can be fried in advance and warmed up in the oven for 6-7 minutes and you do not even need to preheat the oven. Cumin and fennel seeds aid digestion and nigella seeds add an intense aroma. Sparkling water makes them crispy and very moreish. Sieve the gram flour into a mixing bowl and add the remaining ingredients, except the onion, coriander leaves, water and oil. Mix the ingredients well, add the onion and coriander leaves and mix thoroughly. Gradually add the sparkling water and keep stirring and mixing until a soft, but thick batter is formed and the onions are thoroughly coated with the batter. Heat the oil over a medium heat in a wok or other suitable pan for deep-frying. It is important to check that the temperature of the oil is at 170C-180C. Put in approximately half a tablespoon of the batter-coated onion in the hot oil until you have as many as the pan will hold without overcrowding it. Generally 6-7 bhajiyas can be fried at a time. Overcrowding the pan will lower the temperature of the oil resulting in soggy bhajiyas. Fry them until brown and crisp (6-8 minutes) lowering the temperature slightly towards the end of cooking time. Drain on absorbent paper and serve.